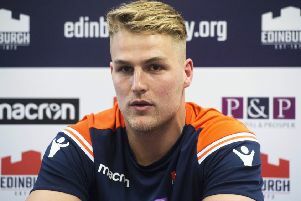 Heriot’s coach Phil Smith left his men in no doubt about his frustration at another slow start, despite eventually booking a quarter-final spot in the Tennent’s Scottish Cup with a 29-20 win at home to Edinburgh Accies. Although they have been on winning form, Smith’s side have played well only in patches over recent weeks. And they did so again against an Accies team that is edging closer to an elusive first win of the season. However, when they did hit their stride, Heriot’s scored 17 unanswered points to overturn an interval deficit. Callum Black, Cammy Gray and Robert Wilson had a try apiece for Accies, and Richard Mill booted a penalty and a conversion as the visitors reached half-time with a 20-12 lead – Alex Ball and Ali Johnstone touching down for Heriot’s and Ross Jones adding a conversion. The hosts raised the pace in the second half and the home pack began to exert pressure, yielding tries for Andrew Simmers and Michael Liness. And a combined forward effort, as they moved unconvincingly into the last eight of the competition. “It was an unacceptable first-half performance from us,” said an angry Smith, whose players will have another chance to show they can perform for the full 80 minutes when they again welcome Accies on Saturday, this time on league duty. Watsonians also eased into the quarter-finals when they safely negotiated a home tie against Marr, scoring ten tries on the way to a 62-5 win over a team that was expected to offer a stiffer test for the in-form Myreside men. Murray Scott and Angus Guthrie both crossed the whitewash twice and they were joined on the score sheet by Lomond MacPherson, Gregor Nelson, Josh Rowland, Fraser Renwick, DJ Innes and Ewan Fox, who also kicked six conversions as Sonians, for whom Andrew Chalmers came off the bench for his 100th appearance. Currie Chieftains were also impressive in posting a 36-0 win away to GHA. Chieftains coach Ben Cairns had particular reason to feel satisfied as his players eased past strong opposition while preventing the hosts – the top scorers in National Division One – from registering on the scoreboard. One team not featuring in the draw for the next round will be Boroughmuir, who bowed out of the competition at the hands of holders Melrose on Friday night.